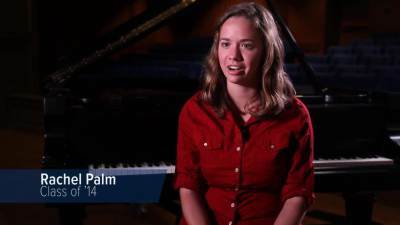 Senior Rachel Palm talks about being a music major. Rachel Palm (Senior General Music Major): My name is Rachel Palm, I'm a senior here. I'm a General Music Major with a piano concentration. I grew up in Brazil, so I was a missionary kid in the Amazon rain forest. When I was eight, I started actually taking piano lessons. I was the kid who would just sit there at the piano all day and just go wild about getting a couple measures right. It was so exciting to me. Someone I really respected said to me, she said, "I think God's gifted you in music and you should try to pursue that." The JBU music department is very much like a big family. My professors were fantastic. Dr. Wubbena, Mrs. Wubbena, are just really great at encouraging people. The seniors were just really great in reaching out to me. A couple of them tutored me cause I had a really hard time with some of the classes. In the spring I have a really big, half-hour recital that I have to do. And I have something that's from the classical genre, I have something that's from the very romantic era, and I have something that's more modern. Kind of more 20th century. So it's a contrasting program, and it's kind of showing off all of the work that you've done for the past four years. When you're getting ready for a big recital, you're using everything you've learned here to make it a good musical experience. My recital is going to be April 27th, at 3:00 in the Berry Performing Arts Center. What I really want to do is teach piano to people, because it's enriched my life so much and so many of the good things in my life have come about because of music, that I just can't imagine not teaching it or not sharing it with people.